As you turn onto College Avenue from Macomb Street you come into view of the Westcott fountain. Even from the bottom of the hill, the image of the fountain is amazing. Especially at night, when all of the fountain lights come on, the Westcott fountain stands out like a beacon. The Westcott fountain was a gift from the 1915 and 1917 classes. 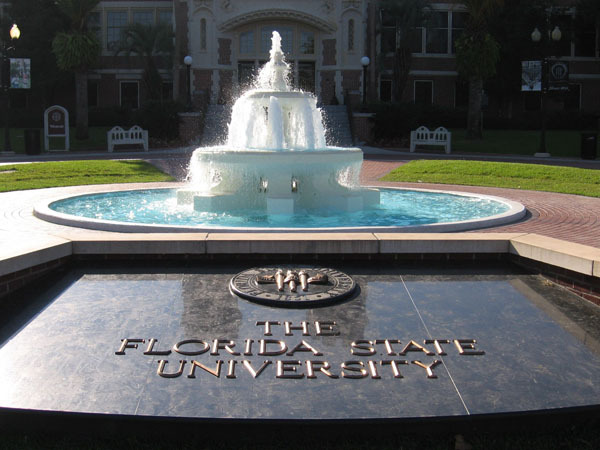 Since 1917, the Westcott fountain has been a symbol of Florid State University’s proud heritage, and pays homage to those who came before. The Westcott fountain is the centerpiece of the courtyard and is complimented by a commemorative Brick plaza, a project of the 1996 and 1997 classes. The Original Westcott fountain was replaced in 1988, by an exact replica. The original had to be replaced due to failure in its support structure. But since its construction, there have been many stories, traditions and myths that accompany the Westcott fountain. One such tradition is getting dunked into the fountain on your twenty-first birthday. This has been a long-standing tradition at Florida State University, and its been said that you’re not truly a Florida State student until you have been thrown into the Westcott fountain. Even Florida State University Presidents have been known to take a dive into the Westcott fountain. In 1965 President Blackwell was thrown into the Westcott fountain. The Westcott fountain is also no stranger to ghost stories. On and around the area the where Westcott fountain now stands was at one point home to the gallows. In the 1830s, that same area was called Gallows hill, a site where executions were once held. 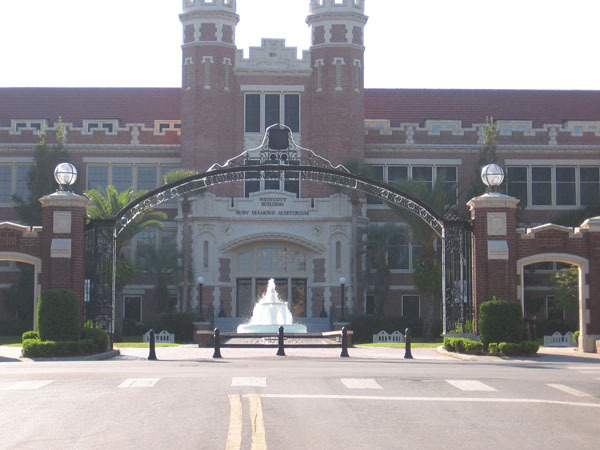 It is not uncommon to encounter a Florida State student who has heard strange sounds or seen unusual things at the Westcott fountain. Late at night, there have even been reports that the executed dead still haunt the hill. Westcott Fountain is also where many students spend their free time. The courtyard is surrounded by benches, which are almost always full. The fountain area is a hub of activity, used as a social meeting place, somewhere to just sit back and relax between or after class, or a relaxing place to study or read. It is also not uncommon to find students splashing around in the fountain on a hot summers day. The Westcott fountain is also the site of many pranks and practical jokes. From time to time a prankster will add a detergent to the fountain causing it to “foam” up. This usually generates a lot of activity around the fountain as students come to see the foaming of the fountain, and to take pictures to show to their friends. Another favorite prank, involves dyeing the water in the fountain. There is nothing like coming up to a fountain that has blood red water spraying from it. Thu these pranks seem harmless, the grounds crew spends many hours cleaning and restoring the fountain back to working conditions. It is hard to image if the classes of 1915 and 1917 knew then how important a symbol the Westcott fountain has become. Surrounded by busy students, Ghost stories, and the occasional prank, Westcott fountain has truly earned its place in Florida State University history.